Since winning the fourth season of American Idol back in 2005, Carrie Underwood has gone on to become a global country music superstar. With a slew of Grammys, Billboard Awards, American Music Awards and countless country music accolades under her belt, along with three US No.1 albums, it seems there’s no stopping the Underwood express. 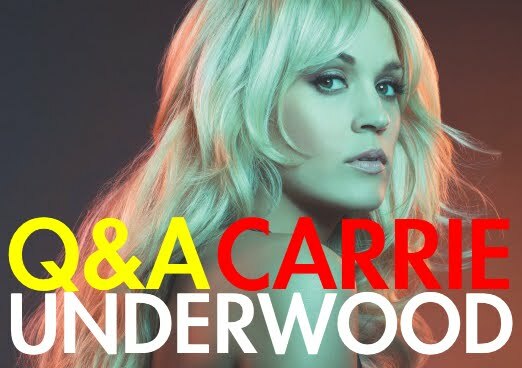 With her new album ‘Blown Away’ just released and an Aussie visit for live shows next month, we ask what fans can expect from both the concerts and the new LP in our second Q&A for 2012. Q : What was it that first attracted you to country music? A : I grew up in Oklahoma, so country music was always around. I loved the fact that there were so many country music artists that actually grew up in Oklahoma. It made me see that I could do it too. Q. You’ve come a long way from your American Idol days – what have been some of your personal highlights since emerging from the show’s shadow? A : I’ve gotten to travel to so many places! I had never even been on a plane before I tried out for American Idol, and now I have been to so many places for work and for vacation. Q. There seems to have been a real stigma attached to singers from reality show here in Australia. How difficult has it been for you to be taken seriously as an artist after coming from a reality show? A : I felt some pressure at the beginning…like people had me under a microscope. But I used every opportunity that I could to show people that I belonged on that stage. Q. You’ve experienced such dizzying chart, sales and award success in the US, but how important are overseas markets like Australia to you (and why)? A : I just love country music and would love to see it in places other than the U.S. I love seeing and performing in new places. As far as chart and sales success in new regions, I’m just along for the ride and hope that people can enjoy what we’re doing! Q. What haven’t you yet achieved in your career that’s still on your list of things to do? A : To be honest, I’m up for anything. I try not to think too far ahead. I just do what I do and keep my eyes and ears open for new opportunities. Q. Your new single is called ‘Good Girl’ and it lyrically deals with a woman who’s still pining for the wrong type of man. Did you write the track for anyone in particular? A : I think we’ve all either been “that girl” or known that girl who was with a guy who didn’t treat her right. I have been both! It’s just a great anthem for women everywhere! Q. Tell us about the new album ‘Blown Away’. What can people expect from album No.4? A : ‘Blown Away’ is a diverse roller coaster ride of an album! I had so much fun writing for it and picking out songs for it and recording it. I truly think there is something for everybody because we take the songs in so many different directions. There are some really great “story” songs that are so visual! I can see what’s happening with the characters in my head while I’m listening to the song. There are also some really sweet songs on the album as well. I just sing songs that I love! Q. What’s your favourite track from it and why? A : All of these songs are my babies! I love them all, but one that is certainly important to me as a person is “Forever Changed.” This song is so amazingly well written and takes the listener on a journey to a sweeter, simpler time. I just love going through the characters’ lives. It’s so beautiful! Q. You’ve just announced an Australian tour, set down for June this year. What can audiences expect from your shows? A : We just love to play and sing and have fun on stage. Our goal is to make sure everyone in the audience has a great time! We (me and my band) love what we do and can’t wait to bring our show to Australia! Carrie’s single ‘Good Girl’ and her new album ‘Blown Away’ are available now. Carrie tours Australia next month (June 26 in Melbourne, June 29 in Tamworth, June 30 in Brisbane and July 02 in Sydney). Tickets for all dates are on sale now.